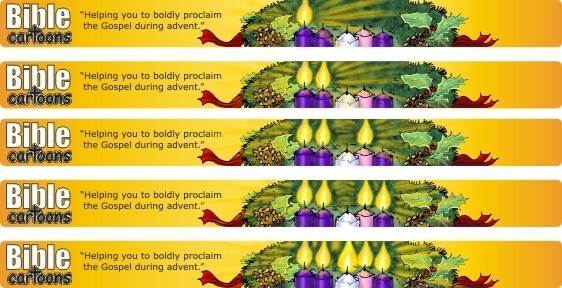 Just finished a new design for the Bible Cartoons header logo, which incorporates an Advent wreath of foliage, pine comes, holly, reed ribbon & 5 candles. As each advent Sunday come along I’ll change the header to include the lighting of the relevant candle – watch this space to see the changes! Week 1 (Sun 30th November) shows the 1st purple candle on the left with a lit flame. Week 2 (Sun 7th December) sees the two left hand purple candles with lit flames. Week 3 (Sun 14th December) sees the two left hand purple candles & the pink candle with lit flames. Week 4 (Sun 21th December) includes all but the white candle lit. Week 5 (Wed 24th December, Christmas Eve) sees the central white candle & all the others lit. You’ll have to come back to the BC website every Sunday in Dec & Christmas Eve to see the actually design in place at the top of this page! Set on the branches of the wreath are four candles: three purple candles and one pink candle. In the centre of the wreath sits a white candle. As a whole, these candles represent the coming of the light of Christ into the world.